Does your bag look like this? The Dungeons of Darkness popping up near Halloween as we closed out the golf season last October in Michigan have nothing on what golfers face when we don’t properly close up shop for the winter: golf bags full of unmentionable things that go ‘moosh’ in the spring. Both January and February appeared and have long since vanished as invitations rolled in for sun-filled trips to Roatan, the Mexican Riviera, and Florida. But those of us who are enlightened to the tricks of traveling light don’t bother to drag our extra baggage-fee laden clubs and instead ‘borrow’ loaners from the resorts. And so, another couple of months go by as my golf bag sits in the garage, untouched. Neglected. It is almost April now, and as shards of sunlight melt the last of the stubborn snows of Michigan, I can’t really put it off too much longer. Time to check out the old golf bag. In mine, I found an old banana. Mummified. Now come on, you can admit you’ve done the same thing. Usually I do a much better job of culling, cleaning, sorting, and buffing clubs, shoes, balls, bags, and sundries at season’s end. But more and more I rebel, thinking that it can’t possibly be the end of yet another glorious golf season. So I stashed the clubs in my garage, unchecked. I procrastinated and believed Indian Summer was right around the corner. Waiting. In December. And there the clubs sat, orphaned, much like a naughty child banished to Time Out. What is your spring ‘dust off the cobwebs’ routine? Warmer weather is here, even in the cold north, so don’t waste those first intoxicating warm days of the year mulling over last year’s leftovers. Get rid of all the junk. Not just in your golf bag but also in your closet or golf storage areas. Clothes: Everyone has outdated shirts with stubborn sweat stains highlighting memorable occasions like the 1979 Tex Austin Open. T-shirts and mocks shrink, lose their shape and mostly lose their color through sun fading. Maybe they don’t fit. Pants with frayed bottoms from rubbing on your golf shoes or worse, the mud and grass……toss ‘em all, especially if your belly is stretching the shirts or hanging over the band. Belts with worn ridges and ragged holes that squeeze the life out of you? Gone. Socks with threadbare heels or holes in the toe (even if it is only one)? Bye-bye. Hats: Who wants to don a sweat-streaked discolored hat or visor? Obviously a lot of folks. But if these toques are faded, misshapen, and cannot be cleansed through the dishwasher trick, toss ‘em. Trust me, you’ll acquire more. I probably have at least 50 caps I could dispose of today. But don’t ask me to relinquish my Superman logo hat or my Pirate-styled ‘Golf Hard’ with the skull and crossbones. No can do. Shoes: Even the best of these have maybe 3 or 4 years of life if 1) you don’t wear them too many days in a row; 2) you use shoetrees; 3) they are of high quality; 4) you wear them on fair-weather days; 5) you clean them regularly. Other than that, figure two good years at best. Take all of the old, smelly, dingy, swampy shoes littering your golf storage space and toss ‘em. Otherwise, plan on the mice using them for breeding and uh……..other endeavors at some point. I am not making this up. Towels: Loosen that malodorous, discolored, shredded golf towel with the now unrecognizable logo hooked to your bag and give it the heave-ho. Has anyone you know ever run out of golf towels? I have 89 of them stacked in closets; but my fave does get washed regularly: a Detroit Fireman’s Fund white towel with a tiny Dalmatian appliqué at the bottom. Thanks, Dad. Some things are simply too precious to toss. Tees: Why do I feel the need to keep every tee I’ve ever owned? Probably because I was forced to purchase them in the olden days at 25 cents a pack. Old habits die hard but at least I ditch the broken ones and you should too…….except on par-3’s. I still pick up tees lying on the tee box and add them to already bulging pocketfuls of even more tees. I think I have tees dating back to my college days. I’ll give you one, or ten, if you ask. Donate them to junior programs. Better still, get the bio-degradable ones. Ball Markers: OK, I know you have a lucky one. So why do you keep grabbing handfuls from any club providing them? The oversized fluorescent ones I can understand but the generic white-bread plain janes have got to go. Toss ‘em. If you are without, use a coin. Don’t toss that. Gloves: If any of your gloves look like petrified road kill, toss ‘em. No, they will not soften up with sweat. Yes, I do notice the hole in the thumb pad. Old gloves are not beneficial anyway because they won’t grip the club for you. Begone! Old Score Cards: Of course you meant to log your stats and file the card in your master Courses Played file. However, if you haven’t done it yet, you won’t. Look them over and unless there is something monumental – like an ace or double eagle – or, if it was signed by your playing partner Arnie or Annika, toss ‘em. Golf Clubs: If your garage is beginning to look like the Second Swing store, it is time to donate those extra clubs to a local junior golf program. Odds are you will use your newest clubs and maybe a stick or two from a previous set. 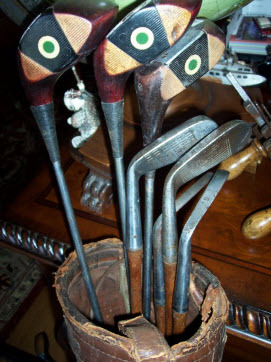 Other than keeping a full set around for travel while one stays at the club or in your trunk, you don’t need dozens of them cluttering up your golf space. The new technologies are so much fun that you wouldn’t want to keep the old Methuselahs around anyway……unless they are really old……and valuable. Balls: Remember that golf balls begin to lose a bit of their ‘stuff’ after a couple of years. Beyond that, keep some for shag practice or for risky shots over water. If you have satchels full of golf balls as I do, give ‘em away. The junior programs can use the gift because the kids will love them no matter what. You can always pack a few extra to toss into the woods to thrill the ball-hawks. Sundries: If you keep band-aids, aspirin, sunscreen, and emergency food in your bag, you may want to replace it all. The band-aids lose adhesiveness from the humidity, sunscreen loses effectiveness after a year, and aspirin turns to powder. Year-old pretzels, chewing gum, and granola bars taste OK but only if you are famished or starving. Money: Digging through my previous year’s bag I always find mad money. Contrary to what the current economy dictates, this money is still good. You do not have to toss it. But you really should have spent it last year when it was worth more. One of the biggest belly laughs I ever had was when my college boyfriend Wayne, the assistant golf coach, decided to take my golf bag home one day and super-clean it for me. An engineering student, he was extremely organized and very precise – in a scientific sort of way. The next day he brought back my bag – unrecognizable now – along with a list of everything that was in the bag, numbered from one to about 75……including some unmentionables every young woman would carry….and listing them as Unused. Oops. That was over 35 years ago and to this day, I smile when reaching into my bag and end up pulling out some item from the paleolithic era.